A couple of days ago, my husband hurt his knee and now has to wear a brace for two weeks which he doesn't have yet. So last night his leg was hurting and he needed to walk as little as possible... and this next part is embarrassing, but helpful in demonstrating my point... Our 9 month old son is now very mobile. Before last week, he would roll around and scoot around, but now he is crawling and curious about everything! So last night, I was constantly up and down moving him back to this side of the room, taking daddy's shoes he was chewing on away, chasing the ball that escaped under the chair, and wrangling a sleepy yet fussy I-don't-want-to-give-in-to-sleep baby. Up down, up down... selfish me wanted to sit in the recliner with my feet up, playing a game on my iPad watching TV. And after the 10th, okay honestly after only the 2nd time (which is the horribly embarrassing part) I was feeling a bit resentful of my husband's injury. It was a very selfish night I had and one that led me to write this post in the first place. My pride wanted me to leave out these details because they put me in a bad light. But I think most people would say, oh you were having an off day, and it's okay to feel upset when your time is interrupted, or you deserve some "you" time. But the problem with those thoughts are that they are not Biblical. But more and more we easily brush off the sin of pride because it's become so rampant in our lives and in shaping our thoughts and actions. Everyday, I struggle with pride. I get frustrated when I'm driving down the road and a car cuts me off, or tailgates me, or drives too slow in front of me, or won't get over, or... I think you get the picture. But it's pride, the thought that I deserve to be respected, that causes me to be frustrated and sometimes get angry which usually causes me to wish they'd get pulled over by a cop, or even say (or think) words that are completely non-glorifying to God. So daily, multiple times a day, I have to humble myself and think of others before me which takes a lot of prayer. A tip for doing this while driving: picture that the people have emergencies they are rushing to get to when they drive crazy, or think of the person who drives slow as a reminder to slow down, look at the sights, turn on the radio and enjoy the drive. Remember that you may be stopped in traffic because there is a wreck ahead and someone could be seriously injured. See, I don't struggle with "big" sin issues like drugs or alcohol (though God weighs all sin the same so there is no such thing as big or small sin). My sin is in the every day interactions I have with the world. And the scary thing is that at times, I can act in a prideful way and not even notice. I can get huffy with the person who just took my parking spot, or roll my eyes when I see people dressed in ways that I deem inappropriate, or rant to my husband about something someone posted on social media that I disagreed with. My pride keeps me focused on the wrong actions of others while I fail to see the consequences of the things I do. My pride expects people to treat me how I want to be treated and if they don't treat me fairly then I can treat them how they treat me... but the Bible doesn't say that. The Bible says, "As you wish that others would do to you, do so to them." (Luke 6:31) It doesn't go on to say, "if they don't then you are off the hook." Actually, the next verses say, “If you love those who love you, what benefit is that to you? For even sinners love those who love them. And if you do good to those who do good to you, what benefit is that to you? For even sinners do the same." Being a Christian means being set apart as different. It means we love the unlovable and do good to people even when people aren't doing good to us. If this is tough for you, then maybe you too have a pride issue. The gift of salvation that we have received should create in us a new heart. No longer can we act how we want to and say, well "I was born like this" or "it's just my nature"- because when we are saved we put our old selves to death and we rose in newness of faith in Jesus Christ. 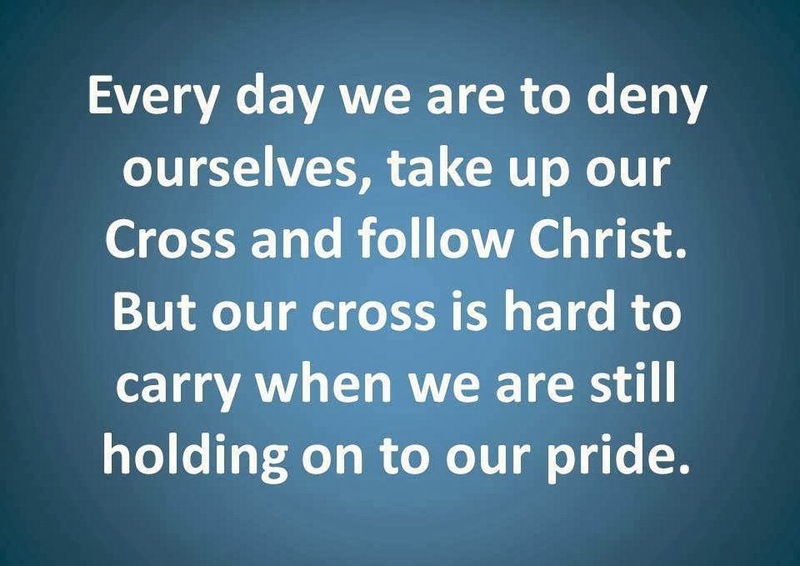 We are called to daily take up our cross, and I don't know about you, but the cross of Christ is much harder to carry when I am still holding on to my pride. And there it is. Ouch. I am a Christian and as such, I am called to be like Christ. And Christ was far from prideful. Actually, He was the epitome of humbleness. He came to earth and served. Are we serving with joyful hearts or begrudging the time it takes us away from "me-time"? Are we putting others' needs before our own? Are we loving the lovable and unlovable? 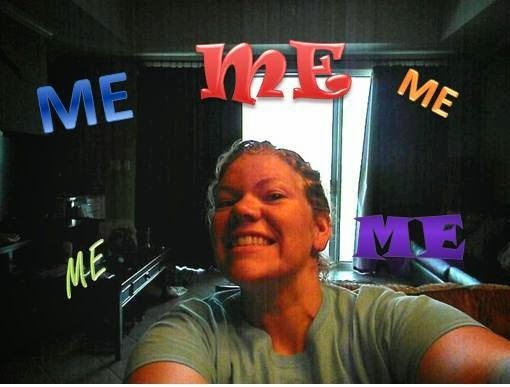 Or are we looking for selfish gain and focusing on what's good for me? My prayer is that God opens our eyes to the pride in our lives. That daily we will focus on Christ and how he lived, patterning our lives after him by humbling ourselves and serving him by serving others.